​This year's Farmville Tour Guides Project will challenge students to create a digital version of the student-led field trip by developing a website that features a singular day in Farmville history. Each student group will be assigned to interview someone who directly experienced the events that occurred on that specific day. For example, students assigned to interview Mrs. Joan Johns-Cobbs will research the R.R. Moton Student Strike that was led by her sister, Barbara Johns, on April 23rd, 1951. These interviews will take place during a special field trip to Farmville's Moton Museum on Thursday, April 20th, 2017. Participating students will prepare for this interview by conducting considerable research about the events that led up to their assigned day in Farmville history. 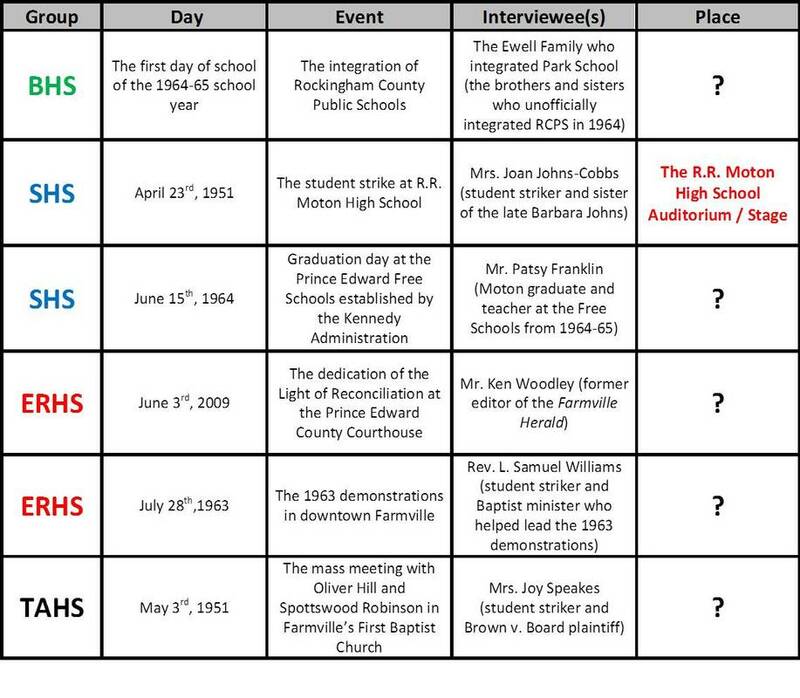 In addition to the interview, students will also have the opportunity to accompany their interview-subjects to specific locations in Farmville where the events they experienced actually took place. Students will document these excursions by taking photographs and videos. Following the field trip, students will complete the project by developing a comprehensive website about their assigned day in Farmville history. (2) Develop a detailed and well-written narrative that discusses the events that led up to your assigned day in Farmville history. (3) Fully address your interview subject in your narrative and explain how they are connected to the events of your assigned day. Please use direct quotes as much as possible in order to maintain the integrity of the interview. (4) Include photos of you with your interview subject on the day of the field trip. (5) Include photos of the location where the events of your assigned day took place. (6) Include an edited video that contains portions of a filmed interview (uploaded to YouTube and linked to your page). (7) Include historical images related to the content of your narrative. (8) Develop a works cited section in MLA format at the bottom of your site.